Last week, my acupuncturist/physiotherapist said that the improvement in my leg has been great and that she doesn’t need to see me for a few more weeks. Yahoo! However, there are a few exercises that she still wants to me do to keep strengthening the muscles that support my knees. First, there are the lunges. I hate lunges. I think it’s because they remind me of high school when we had to Canada’s Fitness Test: how far can you run in 12 minutes; how many lunges can you do in a minute; how many chin-ups can you do, and so on. Now that I’m a big girl, I don’t have to bore myself with repetition; I just have to do 10 good lunges on each side. Usually, I just do them when I have nothing better today; today, though, I decided to do them after my run and that was exhausting; I couldn’t make it past 8 before I lost my balance. The second exercise uses equipment. 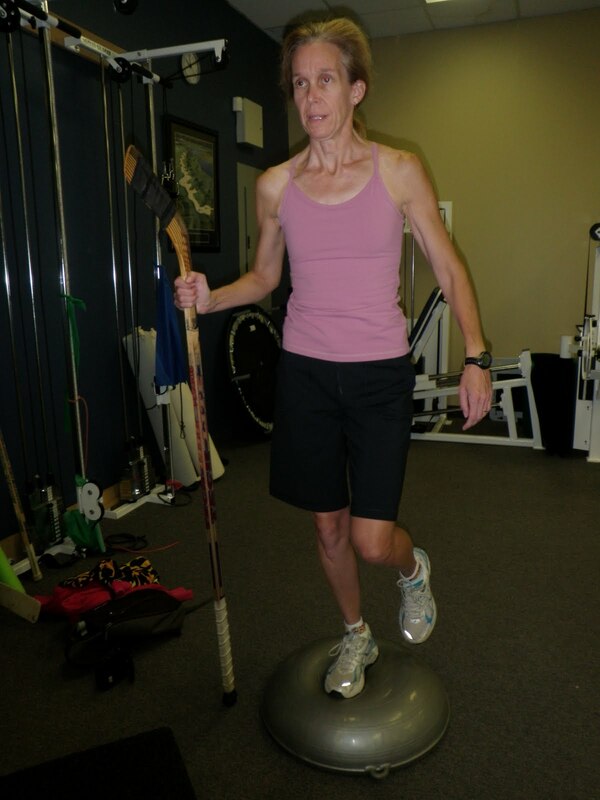 Keeping my hips level and facing forward, I support my weight on one leg while standing on a disc and holding a hockey stick (this is such a Canadian exercise to do). During my first week, we started with 30 second holds on each side for 3 minutes; on Week Two, we bumped the time to 1 minute each side for 3 repeats; now, I hold for 3 minutes on each side – no repeats. I like both of these exercises because they are fairly easy to do anywhere. This year, I’ll likely bring a disc and stick to school with me so that I can get these out of the way during lunch time. I can’t wait to see what my grade 6 boys say when they see the disc; I think I already know who will be the first to ask me where I got such a big whoopee cushion. I love how you make my laziness sound so stupid. I mean why am I not doing some of these simple but needed exercises? I could be doing them in the living room! Sometimes I am so deep in my own rut that I can't even see out of it!